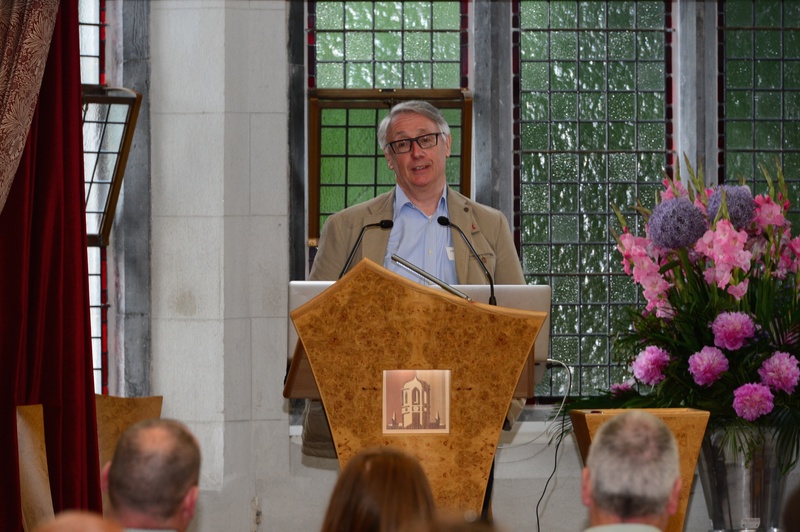 "If You Need An Audience, We Don't Need You"
The following is the Keynote speech given by composer Kevin Volans during CMC's international conference, The Listening Crowd, at NUI Galway on 13 June 2016. The conference took place as part of the International Association of Music Information Centres (IAMIC), which CMC hosted, and was attended by delegates from IAMIC and the Irish music sector. The title of this talk is a quote from Morton Feldman in Darmstadt in 1984. He was addressing the composers attending the International Summer Course for New Music. What he was referring to, of course, was the art of composition - or composition as an art form, that is. And this is what I intend to talk about: composition as an art form and its relationship with the listener. I am talking from the point of view of the composer of New Music. Feldman believed, as many generations before him, and some after him, that art was not to be confused with entertainment. That music has its own evolving philosophy, its own internal intellectual processes and developments, that are not commensurable with the desires of an audience. Indeed, as the person responsible not just for his own work, but for the art of composition itself, the composer should at the very least aspire to a higher level of musical education and appreciation than the audience. What Feldman implied by his statement is that the composer needs to write the next logical piece in her or his own oeuvre but which also will be a contribution to the art of composition. To do this, he or she needs to be free of the expectations of the audience - and not only free from a desire to please, but also free from a desire to shock. This kind of music is rooted in its own history, its own intellectual and aesthetic legacy, and is free from any kind of theatricality. A music that does not set out to be 'beautiful' or 'repulsive' or 'demanding' - these are the concerns of the listener, not the composer. Music of this kind sets out to offer an insight of some kind, something the composer has discovered for themselves - the audience, if they are taken into account at all, are required to make an effort, to collaborate, to listen with intent, with a desire to experience something new. This is the kind of music I embraced - the music of Boulez, Cage, Feldman, Stockhausen, Xenakis, Ligeti - to name a few composers from the generation before me. That the work of these composers went on to generate large audiences is what I hope to cover later on. What should be made clear, though, is that none of these composers set out to wow the crowds in any way when they began work. Music theatre is quite different, because it frequently trades on audience expectation. If the author doesn't take the audience's expectation into account a deus ex machina could well turn out to be stultus ex machina. The author is obliged to take audience expectation into account otherwise his theatrical effects will not work. This falls outside the remit of this talk. But before moving on, I think we need to consider the historical context of these composers and the world of so-called New Music. Feldman made that statement in 1984. That was when Thatcherism or monetarism was really taking root. The year before, Thatcher had privatised public services and sold off council houses, reaping £47 billion for the economy. In 1987 she denied the existence of "society" (saying: "...who is society? There is no such thing! ") and her slogan "value for money" began to be applied to the arts - translated as Bums on Seats. Sadly, she and her followers seemed to lack any understanding of what the arts were. She saw art as upmarket entertainment, an upmarket consumer product, a notion that became so entrenched that not long ago, in the late 1990's Thatcher's ex- Minister for the Arts in Britain and later Chairman of the Arts Council of England, Lord Gowrie, said, in defense of opera: "It's not entertainment for toffs, it's entertainment for all! " Wrong. It's more than entertainment. Opera offers an insight into the complexities of the human psyche - it is a metaphor for, or an exposition, even, of our own personal dreams and nightmares. Football is entertainment for all. It is beautifully translated and formalised gang warfare. Don't worry, I won't go into that now. The point I would like to make is that New Music as an art from the beginning of the 20th century survived either as a very private practice within a small circle of aficionados, or with massive government sponsorship. It is expensive, and it is a great luxury. Only wealthy countries can afford music as an art. And they did spend money on New Music. In a big way. But this all changed in the 1980's. State sponsorship began running out - with the decline of communism, the Cold War running down and the re-unification of Germany (in 1990) there was no need for the West to prove anything and Germany at least needed all its resources to finance the reunification process. The governments pulled out of music in general and New Music in particular and business moved in. I think one of the key examples of this was the Three Tenors in 1990. What a brilliant marketing ploy that was - you didn't even have to remember the names of the singers! The Three Tenors! Even people in the most philistine parts of South Africa, where I come from, knew of them, and didn't have to be bothered to get their tongues around the individual names. And of course, they only sang the juicy bits of opera and operetta. Nothing taxing. Just sit back and relax and let these lovely sounds all wash over you. Then came Classic FM in 1992, set up by an entrepreneurial group to provide a stream of popular classics. Its success was rapidly followed by many others, like South Africa's Classic FM, which now has slots devoted to wine and lifestyle thus endorsing 'classical' music as an adjunct to an upmarket lifestyle, like a sauna, a massage and pedicure, maybe. And because of their computerised playlist, all the short movements of symphonies for example, are given preference - so you may hear endless repeats of the Scherzo of Beethoven's Eroica, but never the great first or last movements! What a nightmare. What I find particularly disturbing is that along with the Music Industry came all its marketing and hype vices: themed festivals (with names like "Festival of Lights "or "Cross-Over Junction"), as opposed to just music festivals, the marketing of 'personality' (over talent), the ruthless exploitation of the young as opposed to the experienced ("the youngest pianist Proms pianist ever") and the beautiful (as opposed to the merely gifted), performers with handicaps like blindness and deafness or lack of professional training, and of course, the cult of celebrity. Labelling and Endorsing. All of which comes back to the same thing: Bums on Seats. Not, how can we further music as an art, how can the audience have a transformative experience, but how do we drag them in to make enough money to cover our costs. At least 95% of all composers get better with age. A very small minority get worse, but this is usually because of illness: Schumann and Stockhausen spring to mind - and there are a few, like Mendelssohn, who sprang forth fully fledged, and didn't really develop. But they are also a small minority. Yet there is more and more emphasis on and support for so-called 'emerging composers' - most of whom, I am sad to say, are left on the scrap heap when they turn 40. I am now old enough to have seen this happen over and over again. In one or two of my curatorial positions, like juror for Schloss Solitude in Germany, I have had desperate letters from composers just over 40, who have won international competitions, and whose careers have suddenly come to a halt. Because they are no longer emerging, they are of no interest. The composers are bewildered and bereft. I think this is morally wrong. There is no such thing, in my opinion, as an emerging composer. There are gifted composers and there are not-so-gifted composers. Age is irrelevant. Emerging, who cares? Publicists. What young composers need, more than commissions and even concerts, is more education. Composition takes as long or longer to learn than playing the violin, for example. For most people, at least 10 years of intensive study. I did a 4 year degree and then 9 years of intensive post graduate study. (That's not counting of course, the composing I did earlier, from the age of 12.) When I was with Stockhausen, we had 14 hours of tuition a week - at least 50 times the current post-graduate norm at Trinity College, Dublin, of about 10 to 15 hours a year. [Think about that for a minute – to get the same amount of tuition as we did in 3 and a half years in the Stockhausen class, you would have to spend at least 175 years on your PhD]. And I think the intense tuition paid off: many if not most of Stockhausen's students went on to have significant careers, Wolfgang Rihm, Clarence Barlow, Claude Vivier, Gerald Barry, to name a few. I get the impression that there is little or no professional training for composers these days. I would love to see Ireland create a training centre for young professional composers, with intensive, serious and prolonged tuition. A kind of a New Music Bauhaus. More important than official study is the time spent talking and listening to other composers. Years of time, spent in a compositional community. So that the young composers are not under pressure to produce, so that their ideas and their education can mature quietly. Handing out commissions to young people who have barely finished their degrees has several bad effects. It puts them under pressure to produce, it makes them believe that composition and having a career are the same thing, and it fosters an idea that composing should be rewarded with money. I have had students in their 20's moaning that they haven't any commissions, and are consequently not writing anything! So much for composition as an art. And anyone with a vocation does not need to be spoon fed. They are perfectly capable of creating their own opportunities, if needs be. Finding new performance spaces, finding new ways of presenting their music. And finding a way to survive economically. No grit, no pearl. On a personal note, the first time I was paid to compose a piece I was 37, and that was after I had a big international and financial success with White Man Sleeps. And I'm not alone in this. This was more or less the norm for my generation. Feldman felt very strongly that one should not make money from composing. He claimed in later life he made money from being famous, not from composing! I had survived by copying scores, making (unpaid) field trips recording African music and then writing well-paid broadcast scripts. Being assistant to Stockhausen and later to Mauricio Kagel. Teaching composition. I took any work I could find that revolved around composition. The reason I have a bugbear about this is that it is my opinion that the standard of composition in the 21st Century amongst the young, is far lower than that of the 20th Century. If you don't agree, you at least have to agree that composers are far less ambitious. The norm nowadays is to produce little pieces of under 10 minutes, very often under 5 minutes. This is another byproduct of the so-called music industry. The most obvious difference between 'serious' music and 'popular' music has always been duration. 'Serious' music composers always wrote works on average of over 20 minutes. This requires a more complex and taxing technical ability than writing 5 minutes. Writing a 5 minute piece is frankly, a piece of cake. The difference between writing that or a work of 90 minutes is like the difference between designing a 2 bedroom cottage or a 60 storey skyscraper. You can do both badly or well, but the skill-set required for the latter is completely different from the former. And why should one want to write a longer piece? Because like Proust, we need time to get deeper into the thought. More profound ideas usually take longer to present and longer to absorb. There has been a compositional consensus on this idea for at least 300 years. A sound bite doesn't cut it. Yet now we find even the ISCM (International Society for Contemporary Music) calling for orchestral scores of less than 15 minutes! Do they realise that almost no major piece of the 20th Century would qualify? This is like an international art fair asking for work no larger than 1 metre by 1 metre. Where did this idea come from? Three guesses. So it's time to cut to the chase: What is the composer's relationship with the audience, with the listener - given that she or he shouldn't take them into account when writing? Well, I think the answer should be: profound respect. No composer I know can bear being unperformed and un-listened-to. We need audiences to show them what we have discovered, what we have struggled with. And to share the experience. For their cooperation we must treat them well. New Music audiences are as sensitive and as picky as people going to a restaurant for the first time. If you want them to come back, everything has to be as perfect as possible. If they find a cockroach in the soup, they will never return. The same goes for contemporary music events. So, disregarding publicity, which others will be dealing with, how do we create audiences for New Music? And how do we help them listen? I'm addressing myself mainly to composers here, because we are the dogsbodies and ultimately the success or otherwise of the concert is our reward and our responsibility. Please forgive me if I'm stating the obvious (below), but these are very much part of helping an audience listen! And these were the norms for New Music Concerts in the heyday of the 70's and 80's, when concerts of New Music were on the whole far superior and better attended. Every detail counts, and every second counts. From the minute the public walks into the building, the concert has begun. A concert is a Gesamtkunstwerk. Very important to help people concentrate on the music and create the right atmosphere. I don't think bog-standard house lighting is good enough. Even if the concert is in a factory space, the lighting can transform the event. For my 50th birthday concert in the Queen Elizabeth Hall in London, they closed the hall and devoted 2 solid days to lighting alone. There shouldn't be more than a minute's pause between pieces. If the stage needs re-setting, this has to be thoroughly rehearsed by a team. Having someone wandering around the stage for 5 minutes fiddling with cables etc. destroys the music. You can't waste the audience's time. They get bored and irritable quickly. Also, I have never met a single composer or a pre-eminent performer of my generation who is not opposed to talking during a concert. By this I mean people interrupting the concert to talk about it. This can work but often, in my opinion, can be disastrous! It can and often does destroy the magic of the event immediately! And the pacing of the concert. Unless it's extremely seductively done, it's like someone switching off your tellie in the middle of a show and standing in front of it and blabbing. Good music of any kind really doesn't need explanation. If it does, then that is what programme notes are for. Pre-concert talk, yes, if you must. But during the concert, NO, in my opinion! This often does not help people listen to the music, it destroys their concentration. This is of course, just an opinion. I haven't done any audience research on this topic. My feeling is, if the concert is enchanting no words are necessary. People wandering on and off as though they are not sure whether they are going to play or move a piano kills the atmosphere. Performers and composers alike need to develop some sort of stage presence. Performers looking like unmade beds doesn't instill confidence in the audience. I'm not saying that people have to dress in a particular way, or dress up. But their appearance is important. It's worth noting that Kronos quartet's rise to fame was assisted by their commissioning top designers to dress them. They created a buzz around 'this season's look'. Maybe this was a little on the entertainment side of the spectrum, but it helped! Every diva has known this for centuries. I feel that there shouldn't be more than 5 new pieces in a concert - no matter how short they are. Overcrowding a programme just exhausts the listener's concentration, as each new piece makes new demands on the audience. Nobody will complain if they have had a transformative experience. Nobody wants to leave exhausted. I thinks it is always a good idea to have at least one classic piece - something that has survived for some decades, something known - on the programme. It helps the listener, particularly if there is something they may recognise at least in part. Great performers bring so much with them, from the minute they step on the stage, and they can truly transport an audience, almost regardless of what they play. I have seen so many audiences completely ecstatic after long concerts of 'difficult' music, because they have been swept along by wonderful performers. Long evenings of continuous 13th Century music played by Sequentia, long, complex Ghanaian solo xylophone pieces played by Kakraba Lobi, an uninterrupted 4+hour Feldman string quartet played by Kronos, audiences besides themselves with excitement after the Ives Sonatas played by Herbert Henck or an audience reduced to complete silence by Musica Antiqua Koeln after an hour and a half of the Art of the Fugue. New Music above all needs to be played perfectly, by perfectly prepared, painstakingly rehearsed, gifted and committed performers. This takes time, patience, and usually money. Many of the performers who essentially launched my work and my career memorised the music before performing it. This is so rare today. Why? Because everything today is budget driven, and quantity is given preference to quality. This is throwing good money after bad. One perfectly prepared and presented concert is worth 10 mediocre concerts. One bad concert drives the audience away. Production values in the world of rock and pop and classical music have never been higher. When it has generous state sponsorship, New Music in Ireland must stop pretending it's underground. The audience always assumes that badly performed music is simply bad music. We need to and can go back to older times, when New Music had large and devoted audiences. We must stop insulting our listeners with poor concerts. Art is not democratic, and resources should not be spread thinly. Simply the best can survive. If we wish to create larger audiences for New Music we must focus on quality not quantity. This means better education and training for the young, more selective programming, more selective commissioning, better curatorship, even less concerts and less commissions if necessary, but higher standards and production values all round. Fabulous pieces fabulously presented. No more cockroaches in the soup, please. Kevin Volans was born in Pietermaritzburg, South Africa, and studied at the University of the Witwatersrand and later with Karlheinz Stockhausen and Mauricio Kagel in Cologne.